Sorry about the late post. Was too tired yesterday night to be able to do anything at all. …..And my wordpress is all rainbow-y and colorful. Probably because of the gay marriage thing. Gongson Chun Gi grinned inside Cho Ryu Hyang’s dream. Now that the boy was out of his dream, he just had to get out on his own. The Heavenly Demon Church had countless spells of sorcery, and the one Gongson Chun Gi used just now on the boy was the Demon Circle Eye (魔輪眼). This was a high-class spell that could interfere with the opponent’s mind, and because of that, Gongson Chun Gi was able to get into Cho Ryu Hyang’s dream. A while after Gongson Chun Gi left, Cho Ryu Hyang, who was standing there like a stone statue, moved. Cho Ryu Hyang stretched his neck to loosen his muscles a bit, then opened his eyes to look around. He then spoke with a surprised tone. The moment Cho Ryu Hyang spoke, his body became as soft as clay, and turned into the body of an old man. Zhuge Liang waved his feathered fan and looked around. Zhuge Liang smiled unconsciously when he thought of someone from the past. When Cho Ryu Hyang regained his consciousness, Jo Gi Chun came up to him. Cho Ryu Hyang calmed himself, and opened his eyes. He could see his worried teacher, and the muscular old man. The middle aged man that scared him in the dream. After looking around for a while, Cho Ryu Hyang soon nodded. He could see the middle aged man, who had his eyes closed with a wrinkled face, sitting at one side of the temple. The mysterious presence he felt in the dream. While Cho Ryu Hyang was feeling a bit dizzy, the middle aged man opened his eyes. The moment Gongson Chun Gi opened his eyes, he started wondering about something. He just paid a visit to Cho Ryu Hyang’s dream, but it felt like he had missed something. What was this? The feeling that he had just missed something huge? Gongson Chun Gi thought about it for some quite some time, then regained his senses, and approached Cho Ryu Hyang. There was something even more important to be done. Was this not the boy who could become his first disciple? Cho Ryu Hyang looked at the man with an awkward face. He still couldn’t really determine whether if he was still in the dream or not. After observing the boy for a while, Gongson Chun Gi opened his mouth. Matters like these had to be settled quickly. He wanted to take care of everything before the pope changed his mind. To Guardian Wu, the heir to the church had to be chosen quickly. But unlike Guardian Wu, Gongson Chun Gi thought of the boy’s well being first. Gongson Chun Gi shook his head. He didn’t want to rush an exhausted child. Gongson Chun Gi took a look at Jo Gi Chun, and spoke. Jo Gi Chun nodded, and smiled. He felt satisfied by seeing Gongson Chun Gi be considerate towards Cho Ryu Hyang. He could feel that Gongson Chun Gi put the safety of the boy first and foremost out of anything. That moved Jo Gi Chun’s heart. When Jo Gi Chun tried to support Cho Ryu Hyang to get out,, Guardian Wu came to him with haste. That’s why he treated Cho Ryu Hyang with great care. Cho Ryu Hyang tried to walk away on his own, but Guardian Wu was insistent on helping him. Already the man had started to pour in his inner energy to strengthen the boy a bit. Cho Ryu Hyang felt bothered by how the old man suddenly addressed him, but he didn’t talk. Cho Ryu Hyang didn’t even have the strength to do so. He wanted to rest for now. Jo Gi Chun looked at the boy with a complicated face. Neng Ha Young looked at the paper that her bodyguard gave her. Her eyes sparkled soon after reading it. The name and the approximate age, and the appearance of the boy. To find all this so far was truly quite amazing. The time given was short, and the information about the individual was already non existent, after all. Neng Ha Young expected this, but she was still disappointed. It felt like the boy had something special about him, but the information about the boy was too lacking. Neng Ha Young tapped the table with her index finger, and spoke. The boy definitely learned something. A type of martial arts that was very profound. There would be no way for the boy to find a hidden peak expert like that otherwise. If she found out the boy’s relation with the Heavenly Demon Church, she would be able to find out what the church was currently trying to do in the Qilian mountains. Thinking that, Neng Ha Young looked back at the time when she separated a few days back from Cho Ryu Hyang. This was the first thing Um Seung Do said when they reached the docks. Neng Ha Young stared at Um Seung Do’s face when she heard that. Um Seung Do was trying to push away the overly inquisitive girl here. If it was Neng Ha Young, she would be able to catch onto what the church was trying to do with just a small evidence. After all, she was pretty famous for her intelligence. In other words, she was bothersome. That was why Um Seung Do had to get rid of this cursed thing here. Neng Ha Young glared at Um Seung Do. Wasn’t his plan too obvious? This man just didn’t want her to know more about what was going on with the church. What were they doing on the Qilian mountains? Wasn’t there any way to find out? She thought for a while, but couldn’t come up with anything. Something happened at the Heavenly Demon Church. This was an excuse that prevented anyone from prying further. Neng Ha Young, who was biting her lower lip in frustration, finally came up with something. She smiled. Um Seung Do forcefully smiled at her in response, even though he felt that something bad was going to happen. Um Seung Do swore at Neng Ha Young’s face, and made a regretful face. Neng Ha Young spoke right then. Cho Ryu Hyang, at the moment, was trying to board the carriage in front of him. He could see the troubled Um Seung Do with Neng Ha Young. He could immediately see that there was something going on with the two. Cho Ryu Hyang took a look at his teacher, and quickly settled on a decision. Um Seung Do’s face twisted. Was the boy dumber than he thought? Could that boy really not see that this wasn’t a time to speak? When he saw the boy’s face, it didn’t seem like a possibility. No, the boy did say his name on purpose. Um Seung Do ground his teeth, and thrust Cho Ryu Hyang into the carriage. Looking at Um Seung Do, who put quite an emphasis on “young sir”, Cho Ryu Hyang nodded. He knew what Um Seung DO was trying to hide. So he leaked some information. Come to think of it, he only knew that she was the granddaughter of Neng Mu Gi. He didn’t actually know her name. Um Seung Do said this, and quickly took off to the Qilian mountains. The boy’s name was sure to be a clue for that crafty little girl. She’ll surely try to find out what the church was planning with the information. He really didn’t like these kids. If the girl found out about all this after the event, then it would be all fine. But if she found out during the event happened, that would be different. The only option for him now was to finish all this as fast as possible. After that, things would get much easier. Thinking that, Um Seung Do moved faster. Um Seung Do’s face twisted. He thought that nothing was ever going his way. Jo Gi Chun, not caring a single bit about what Um Seung Do was thinking, looked at the stone wall with a complicated face and spoke. To Um Seung Do, Jo Gi Chun’s words were just like the death sentence. Um Seung Do made a horrified face, and spoke to Jo Gi Chun. They had to avoid a fight with the Alliance. This was the will of the pope. And the will of the pope was the law to Um Seung Do. Jo Gi Chun looked at Um Seung Do, and nodded. He knew that they didn’t have much time. Why else would they leave Cho Ryu Hyang to rest and bring him here urgently? Jo Gi Chun still didn’t know what the Heavenly Demon Church was, exactly. But he still could figure out that the organization was quite outstanding. Indeed, the formation here could definitely be called the most complicated formation under the heavens. But if the people from the church made up their minds, they could always break it open by force. But they didn’t do that. They were approaching the formation as carefully as possible. That meant that there was something in the formation that was extremely valuable to them. Um Seung Do thought a bit here. Should he tell the truth to the old man? Did the old man have the right to know about what was in the formation? While he was thinking about all this, Um Seung Do remembered the message Guardian Wu gave him. If he didn’t understand the message when he was told that much, he would be an idiot. But to think that that arrogant little boy would become the heir? On their way to the Qilian mountains, Um Seung Do saved the boy once, but also tried to kill him. 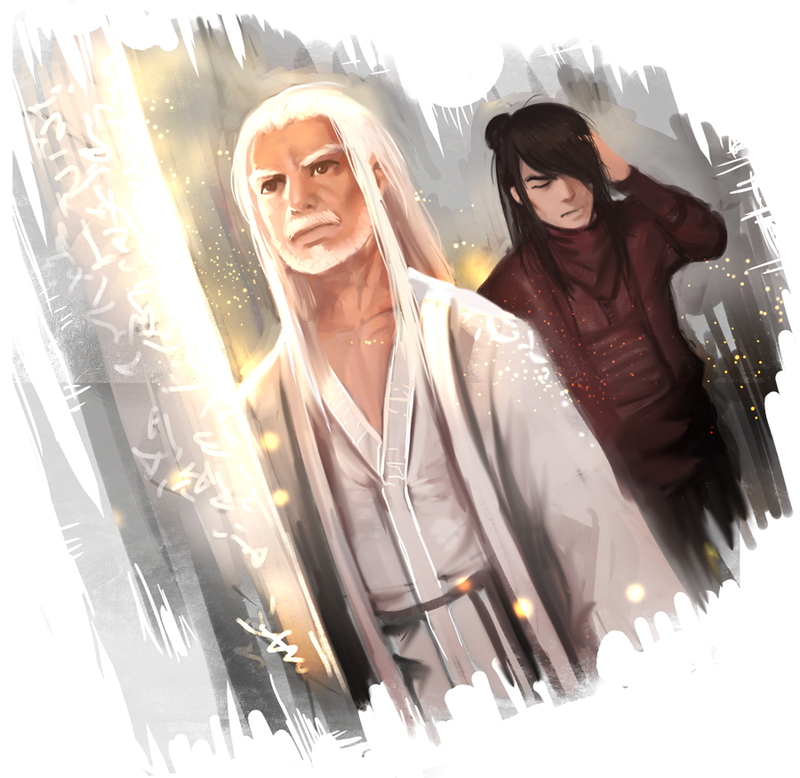 Back then, he just saw the boy as a disciple of the old man, after all. And he could get away with it just by saying that the boy was about to leak the church’s secrets. But, a heir? What was this? He was just about dead now. To think that he tried to kill a person who was about to become the young lord of the church……. by choking him, no less. Um Seung Do wanted to scream when he thought that, but he didn’t do so in front of Jo Gi Chun. But he really was feeling bleak. A message from Guardian Wu was almost guaranteed to be the truth. There was only one way for Um Seung Do to live. He had to look good in front of this old man, at least. His relation with Cho Ryu Hyang was at its absolute worst, but didn’t he act quite well in front of this old man, at least? And the boy really revered his master quite well. He just had to look good in front of the old man. That was the way to live. Based on what the object was, Jo Gi Chun could use it while undoing the formation to an extent. That was because the formation would inevitably be damaged while being undone. Um Seung Do spoke with a serious face. To be more truthful, this was the place where Ak Jung Pae’s treasures lay. With his martial arts technique……. The Heavenly Demon Church came to retrieve those items. I really love this series out of all the other series going on right now. Frankly its strange you do not have more comments. Please keep up the amazing translation speed! I wonder if that girl’s grandfather is also in there right now? Thanks so much for all your hard work!! I love this one soooooo much!!! i hope he becomes xianxias jesus disciple!